For 3-4 people, on the first floor with a large balcony, a lovely view, 1 double bedroom, and 1 bedroom with a French bed. There is a large comfortable, fully fitted eat-in kitchen with a sofa bed and a bathroom with a shower and a toilet, a washbasin, a fan, and a hair dryer. Standard rates are shown for 3 people. For the high season/carnival/New Year's Eve, shown rates are based on full occupation (4 people). Pets are allowed if under constant supervision and for an additional charge. A ski boot dryer and a large ski storage room are available, free of charge! A large parking space is available just in front of the holiday house, also for long-term tenants! We built our Höllwarth cottage in 1997, with a lot of attention to details. All of the apartments are fully equipped, cosy, and functional. The Höllwarth cottage, with a total of 3 apartments, is a perfect place for relaxation among couples, families, or groups. All of the living units are comfortable and functionally fitted. 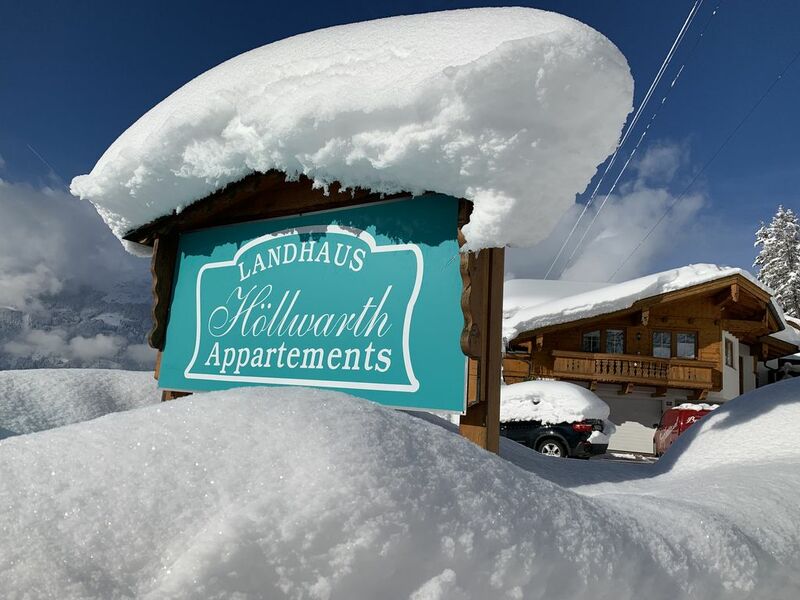 Beautiful location offering a lovely panorama by the edge of the forest, on a very sunny spot, and with a good connection to the Zillertal Arena ski/hiking area; a ski bus stops by the house and also Zell am Ziller is just a couple of minutes away. Wireless internet is available on site, for an extra charge. An extra-large refrigerator with freezer compartment is available. A large southwest-facing balcony with a fabulous view! There are two more holiday apartments in the building; all of them are also available for long-term renting! The apartment was spotlessly clean and as shown and described on the website. The owner lives on site and was always happy to help when we had questions. The bed was very comfortable and the double glazing means that the apartment is very quiet at night. The balcony was a real bonus, with comfortable furniture and a fabulous view. The kitchen is well equipped with almost everything (the only thing I would add is an oven mitt for lifting hot trays and dishes from the oven). The shared washing machine is in the basement and costs 5 euros per load. The wi-fi was 20 euros for two weeks and is OK although a bit slow and often dropped out altogether (while on holiday we didn't need to use it much, so it wasn't really a problem). The hiking in the area is very good - there is even a hiking track from the hamlet of Gerlosberg where the apartment is down into the nearest town of Zell am Ziller. The tourist information office in Zell sells a good set of hiking maps for 12 euros. I'd recommend the Hotel Brau in Zell for good traditional Austrian food. The Zillertal Regional Museum is also interesting and worth a visit (and only 3 euros each). Hi, many thanks for your good responce! "Good location close to Zell am Ziller (by car). Clean, nice and quiet appartment with beautiful view to the valley and mountains. Everything went smoothly and worked well." "It was great! This accommodation is very clean, nice, good equipped. Everything is new. It's on a heel with a beautiful view to the valey and mountains. Easy access to skilifts by car or skibus. Kathrin and Manfred are friendly and helpful. Very good!" "The property and surroundings were excellent. Frau Hollwarth was very helpful and we would have no hesitation about returning to the appartments or using or recommending Homelidays to a friend." Unsere Familie hat den erneuten Skiurlaub in Gerlosberg sehr genossen. Wir wurden auch dieses Jahr von Kathrin sehr freundlich begrüsst und die Wohnung war in sehr sauberen Zustand. Auch die Woche durch hat alles sehr gut geklappt. Wir kommen gerne einmal wieder. Superschöne Lage, die Unterkunft hatte alles, was man braucht! Freundliche Hausherrin, Hunde sind auch willkommen. Der Ausblick vom Balkon, ein Traum.